Also can transport pipe, lumber, conduit, gutter, etc. Side Wall Ladder Hook Assembly Only is an expansion kit to hold a second ladder. 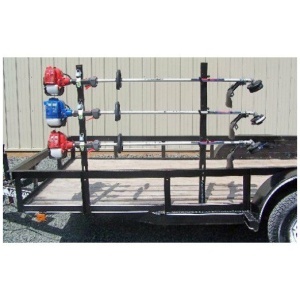 Pack ’em PK-6 accessory holds 3 string trimmers and mounts on open trailers. It is fully lockable and is easy to install. Designed to securely transport 3 trimmers in your enclosed trailer. Stepped off the wall design, to accommodate engines and guards. Top 2 sets of hooks are slightly tapered in to prevent trimmers from bouncing. Bottom set of hooks have a wider opening to accept large tube diameter tools, such as power pruners. Make the most of your storage space with Rack ‘EM Trailer Organizing Rack Systems. 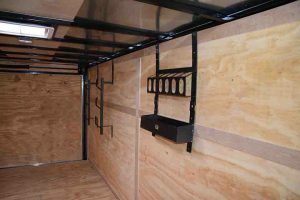 Your trailer can become the safe, clean, organized space it should be. 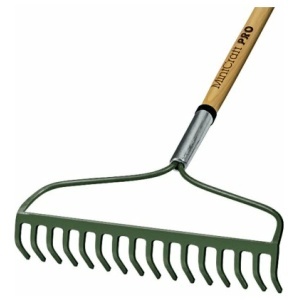 Heavy-duty steel contruction and a two-layer, hammered paint finish withstand years of wear and tear. This rack securely holds 3 trimmers and has a built-in locking mechanism. Includes left and right brackets. 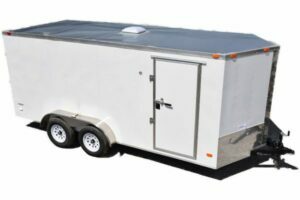 Holds one round steel can or one rectangular plastic can / cooler in enclosed trailers. 16 quart capacity rectangular plastic coolers such as: Blitz, Igloo, Playmate Elite and more. 5 gallon round gas cans such as: Eagle, Just Rite and more. 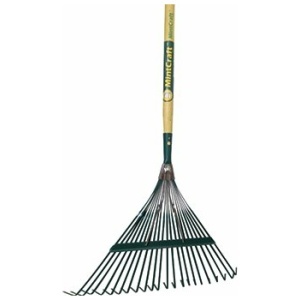 Strategically spaced hooks will hold rakes and other types of hand tools in enclosed trailers. Using the 2 sets of hooks on either end of this rack for things like hoses, extension cords, ropes and more. Helps prevent kinking due to the closely spaced hooks. Hooks have 100 & 1 uses: hold cords, belts, tie downs, etc. Holds almost anything that coils or has a loop on it. Designed to hold a back pack blower by its grab handle for enclosed trailers. Cross member supports the blower’s back rest and secures the unit with the included bungee cord. Bottom hook keeps the blower tube tucked in against the wall. Bottom hook can do double duty as a hand held blower hook too. The RA-14 basket kit bolts to the side rails of an open trailer and can hold a large variety of equipment, tools, supplies and more. 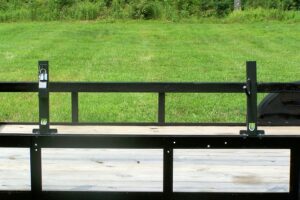 It bolts directly to a 6-1/2’ wide trailer and comes with a 6” angle iron kit that will allow it to fit trailers width from 72″ to 84″. Unique 2-spring design gives extra power when needed automatically, and provides a smooth jerk free movement all the way down and all the way up. Shortest unit on the market taking up the least amount of rail space, which leaves room for other needed racks.